https://www.kipling-usa.com/100-pens-case/100041953.html 100 Pens Case The 100 Pen Case Organizer is a must-have for anyone who is looking to keep small accessories in order. The name says it all; you can fit up to 100 pens or pencils inside its roomy interior – 26 within the pen loops and 74 within the base! This colorful pen case can also be used for art supplies, makeup, or as a travel cosmetic case that can easily be thrown into a backpack, tote, or carry-on luggage. I was always running out of pens and pencils at work, but now I stock this pouch regularly and I’m always prepared for meetings. The kids love these cases!!! 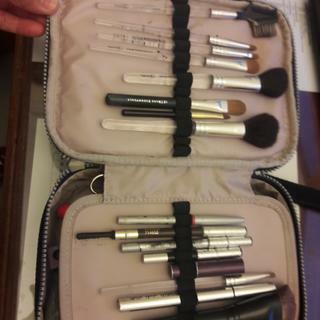 Nice to use as a make up kit. I used it as a make up kit. Perfect size and sturdy. Just wish the liner inside is darker so the smudges stain from the product won't be seen. And wish there is a bigger slot to hold larger brushes. My daughter really likes the separate compartments, how lightweight it is and how much it can hold. Great pens case lots of room for pens, pencils and colors. well made. pretty color. easy to use. but, wish these are 100 holes for pens. Great quality and perfect site. I can save all my color pencils. This product is amazing for school and office! Thank you Kipling! I would and have bought this item over and over. Love this product. Have seven of them so far. Use them to carry lots of things, not just pencils and pens. It actually does not fit 100 crayons on it. Own 5 and one more on the way! Waiting for another good sale to buy the rest of the colors! This is a good product for school, I just wouldn't use it for other stuff. 100 Pens Case, more like don't stuff 100 ribs in it! Great case! Used it for two or three years! It stored many items but putting ribs in it turned my life upside down. Just be careful around food and you'll be fine! Otherwise, its a great addition to my lifelong family of Kipling Products. I look forward to purchasing the black to hide BBQ stains! 100 Pens Case, more like don't stuff 100 ribs in it! Great case! Used it for two or three years! It stored many items but it putting ribs in it turned my life upside down. Just be careful around food and you'll be fine! Otherwise, its a great addition to my lifelong family of Kipling Products. I look forward to purchasing the black to hide BBQ stains! Although, this nice pouch is much very stylish it gets dirty in snap. But overall, I believe that this item is good for gifts and much more. Hope you have taken my advice on this subject! Unfortunately the case does not actually hold 100 pens - there are only holders/straps for ~28 pens(?). In addition, any pen with rubber does not slide into the straps. I have the zebra sarasa pens, pilot juice pens, and another set of pilot pens. None of them work in this case. The straps get caught on the rubber. In addition, once you get the rubber part past the straps the spacing of the case is very tight even with my normal width sarasa pens! Very disappointed that this product didn't work for me, I desperately wanted something to hold all my pens! I love this product so much! This Pens case is just the right size. Every I need fits perfectly inside of it from my pens to my scientific calculator and clicker. It's a life saver. Every nurse should get one! I love it! Beautiful color and very useful! Thanks! The best pencil case ever! For the first time my son kept everything in order! The 100 pens case came damage!!!! Zipper was unstitched!!!! Enough organization for "important" pens and pencils, plus space for other stuff. spacious for the various writing utensils I buy for my child. Because I need for my school. And we love Kipling. Because i like the material its made out of and i find the case very practical to work with. My boys love these. Helps them keep organized throughout the year. And very robust. Lasts 2 to 3 school years every time.